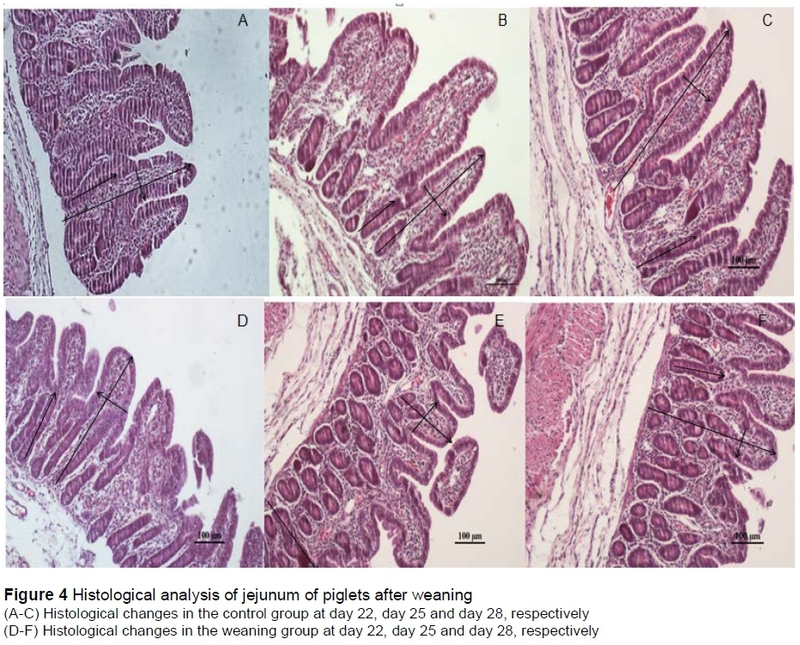 This study was aimed at investigating the effects of weaning on jejunal redox status, morphology and expression of cell cycle regulators in piglets. A total of 120 new-born piglets from 12 litters were divided into two groups: the control (suckled normally) and weaning group (weaned at day 21). Six piglets from each group were slaughtered at day 22, day 25 and day 28. Results showed that weaning increased the serum hydrogen peroxide (H2O2) and malondialdehyde (MDA), decreased inhibitory hydroxyl radical (IHR) concentrations and superoxide dismutase (SOD) and glutathione peroxidase (GSH-Px) activities at day 25. Furthermore, the jejunal nitric oxide (NO) level was increased at days 22 and 28, while H2O2 concentrationwas increased at days 22, 25 and 28. Results of jejunum morphology showed weaning decreased villous height and width, and increased crypt depth at day 25. Relative mRNA and protein expression showed that Smad4 was decreased at day 25 and then increased at day 28. The expression of p21 and p27 were significantly increased by weaning at days 25 and 28, but cyclin D and cyclin E showed no significant differences compared with control group. In conclusion, weaning increased the serum and jejunal reactive oxygen species (ROS) production, inhibited jejunum development and cell cycle progression through down-regulation of Smad4 and up-regulation of p21 and p27 of piglets, which further explained weaning-induced stress syndrome. Weaning is a systemic response that involves physiological, environmental and psychological changes in piglets, which lead to disturbances of intestinal barrier function and poor growth performance (Heo et al., 2013). Previous studies found that oxidative stress caused by weaning may be an important factor that affects intestinal dysfunction in piglets (Zhu et al., 2012; Yin et al., 2014). In addition, a previous study indicated that weaning stress induced overproduction of reactive oxygen species (ROS) and eventually contributed to apoptosis and inhibited cell proliferation in the small intestines of piglets (Zhu et al., 2014). In fact, eukaryotic cell proliferation is precisely regulated by cell cycle, which is controlled by a regulatory network. Cell cycle progression consists of four sequential phases: gap (G0/G1), synthesis (S), gap (G2), and mitosis (M), which are regulated by cyclins/cyclin-dependent kinase (CDK) and CDK inhibitory proteins (CKIs) such as p21 and p27 (Hunter, 1995). Cyclin D is the central regulator in the G1 phase, while cyclin E plays a critical role in inducing the G1→S transition (Hartwell & Kastan, 1994; Doonan & Kitsios, 2009). Negative regulators, such as p21 and p27, restrain the expression of these cyclins and the activities of cyclins/CDK complexes, inducing cell cycle arrest and consequently inhibiting cell proliferation (Cheng et al., 1999). Intracellular redox status such as ROS is directly involved in cell division and cell cycle regulation (Delgado et al., 2015; Lallès et al., 2007). ROS can modulate cell cycle regulatory proteins and cell progress. High doses of ROS may cause growth arrest and cell death (Martindale et al., 2002). Oxidant-reduced expression of cyclin D1 has been found in fibroblast cells owing to the effects of H2O2exposure (Barnouin et al., 2002). A dramatic decrease in cyclin E-CDK2 activity induced by oxidants is described in lung alveolar epithelial cells. 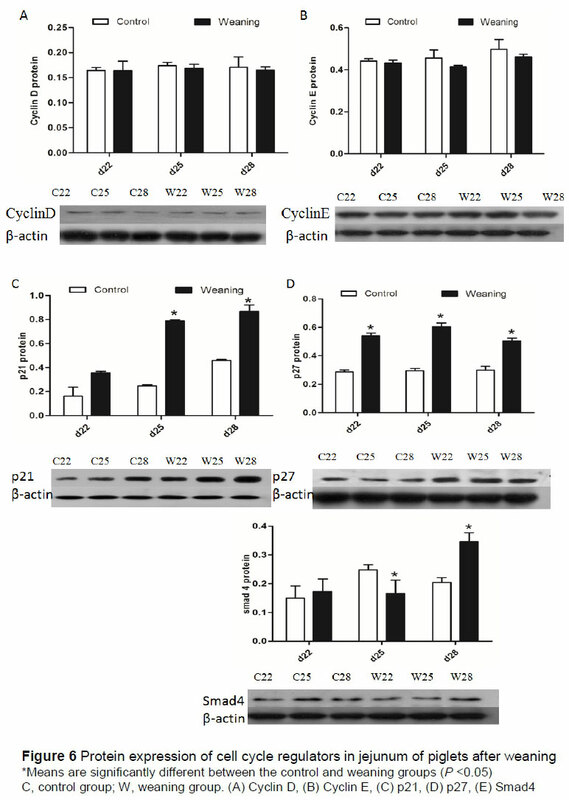 These results suggest that oxidants may block G1 entry into S phase by decreasing the cyclin D expression and activating cyclin E-CDK2 complexes due to CKI binding (Corroyer et al., 1996). Recent research using microarray analysis suggested that weaning may cause cell cycle progress change in the intestinal epithelial cells (Zhu et al., 2014). However, so far, studies about the changes of cell cycle regulatory proteins such as cyclins and CKIs in weaned piglets are scarce. Therefore, this study aimed to explore the redox status, morphology change, and altered expression of cell cycle regulatory proteins in the jejunum of post-weaning piglets. All protocols used in this experiment were approved by Guidelines for the Care and Use of Laboratory Animals, established by Shanghai Jiao Tong University Institutional Animal Welfare and Use Committee. About 120 new-born piglets (Duroc × Landrace × Large White) from 12 litters were randomly assigned by litter into a control group or a weaning group, resulting in six litters per group. Each litter was treated as a replicate. Piglets in the control group stayed with the sows in the farrowing unit and suckled until slaughtered, while the piglets in the weaning group were weaned at 21 days old. From 7 to 28 days old, all of the piglets were allowed free access to a commercial creep-feed. 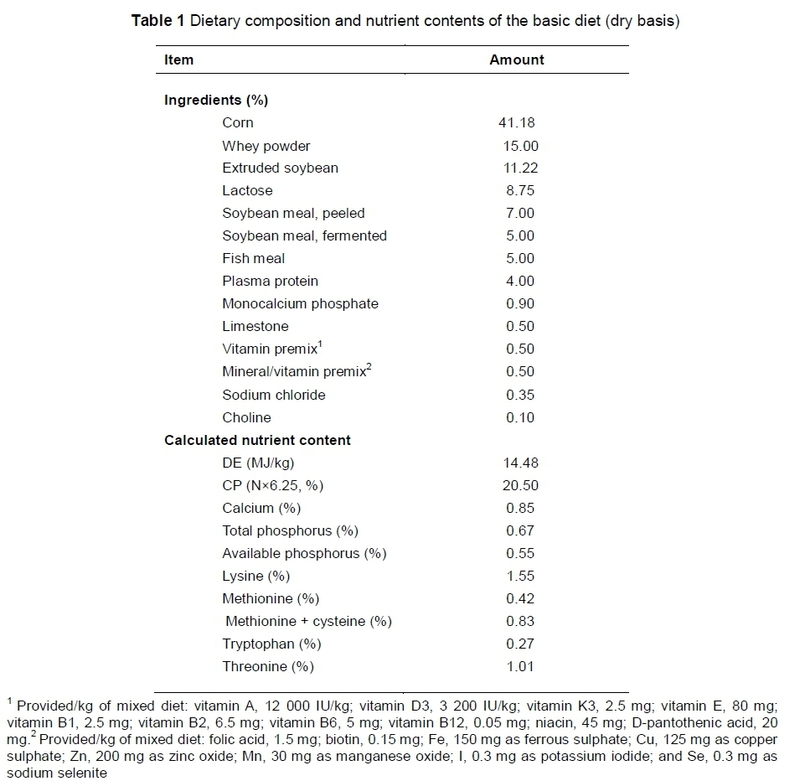 The dietary ingredients and nutrition levels are shown in Table 1. All piglets were kept in nursery pens and had free access to water during the experimental period. The room temperature was maintained constantly at approximately 25 ºC. At days 22, 25, and 28, one piglet (similar average bodyweights (BW)) from each litter was randomly selected and bodyweight was measured. The selected pigs were euthanized through an overdose of sodium pentobarbital intramuscularly (50 mg/kg BW). Blood samples were collected from the anterior vena cava, and serum was collected after centrifugation (3500 g, 15 min, 4 ºC). Samples were stored at -20 ºC pending antioxidant capacity determination. In parallel, the entire small intestines were carefully removed. Approximately one centimetre of jejunal was collected from the middle part of the jejunum. After washing in PBS, the samples were soaked in 4% triformol in PBS for the intestinal morphological assay. Meanwhile, the jejunal specimens were frozen in liquid nitrogen and stored at -80 ºC for quantitative real time-PCR and western blot analyses. The activities of superoxide dismutase (SOD, EC 1.15.1.1) and glutathione peroxidase (GSH-Px, EC 1.11.1.9) as well as the malondialdehyde (MDA) concentration and inhibition capacity of hydroxyl radicals (IHR) in the serum were determined by using the enzymatic colorimetric methods according to the manufacturers' instructions (Nanjing Jiancheng Bioengineering Institute, Nanjing, China). Briefly, SOD activity was determined with the hydroxylamine method by monitoring the inhibition of reduction of nitro blue tetrazolium and absorbance at 550 nm was recorded. GSH-Px activity was monitored with the 5,5-dithiobisp-nitrobenzoic acid method, spectrophotometrically at 412 nm. The concentration of MDA, which is an indicator of lipid peroxidation, was analysed with the thiobarbituric acid (TBA) method with an absorbance at 532 nm. H2O2 was analysed with the molybdic acid method at an absorbance of 405 nm. The concentration of IHR was detected with the Fenton's reaction method and the changes of absorbance were read at 550 nm. All absorbance levels were determined by spectrophotometric assays (Thermo Fisher Scientific, CA, USA). The jejunal specimens were soaked in 4% neutral buffered formalin, then embedded in paraffin wax. The paraffin blocks were serially sliced into 5 μm thickness. They were then stained with routine haematoxylin-eosin for examination, including villus height, width and crypt depth of 20 well-oriented villi in each sample using an image processing and analysis system (Olympus Co., Tokyo, Japan). A free-radical analyser (TBR 4100, World Precision Instruments, WPI) was used to record the NO and H2O2 levels in tissues. Electrodes of ISO-HOP-100 and ISO--NOPF-100 were used to monitor the NO and H2O2 in the intestine. Nitric oxide (NO) concentrations were determined using the NO electrode and the S-nitroso-N-acetyl-DL-penicillamine (0.2 to 500 nmol/L) combined with CuCl2 catalysing was used to construct the calibration curves by the generation of a known amount of NO in the solution (Zhang et al., 2000). For the H2O2 measurements, the H2O2 electrode calibrated with known concentrations of H2O2 and H2O2-equilibrated solutions from WPI were used. The total RNA from jejunal tissues was extracted with TRIzol reagent (Invitrogen, USA) and quantified by spectrophotometry (Nano Drop Lite, Thermo Scientific). Ratios of OD260 and OD280 between 1.8 and 2.0 were considered high quality. The PCR reaction was performed in a volume of 20 μL with an ABI Plus 7500 System (Applied Biosystems, USA) by SYBR Premix Ex Taq kits (TaKaRa, Japan). The PCR program was performed as follows: 95 °C for 30 sec, cycled for 40 cycles at 95 °C for 5 sec, and 60 °C for 30 sec. Internal controls of β-actin and glyceraldehyde 3-phosphate dehydrogenase (GADPH) were used to normalize target-gene expression using the equation 2-ΔΔCt (Livak & Schmittgen, 2001). 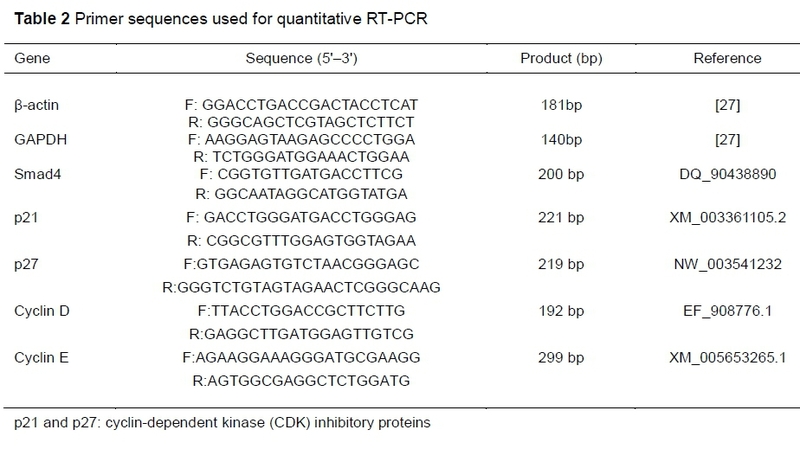 The primers designed for RT-PCR are listed in Table 2. Agarose gel electrophoresis was used to verify the amplification products. For western blot analysis, samples were homogenized in RIPA lysis buffer (KeyGEN Biotech, Nanjing, China) and protein concentrations in the jejunal tissues were measured by BCA analysis. Protein (30 mg) was loaded and separated by SDS-polyacrylamide gels electrophoresis. The proteins were then transferred to nitrocellulose membranes. Mouse monoclonal cyclin D, cyclin E, Smad4, p27 and p21 antibodies from Santa Cruz Biotechnology (Santa Cruz, CA, USA) were diluted 1 : 200 and incubated with the membrane for one hour. After washing, anti-mouse IgG labelled with horseradish peroxidase was incubated and diluted to 1 : 500. The results were visualized with the ECL detection system (Amersham Biosciences). All data are presented as means with standard error. Statistical analysis was performed with the independent sample t-test method to compare values between the control and weaning groups, using SPSS 17.0 statistical software (SPSS Inc., Chicago, IL, USA). P <0.05 was considered statistical significance. Compared with the control group, the BWs of piglets were not significantly different (P >0.05) in weaning group at day 22. But weaning significantly decreased (P <0.05) the BW of piglets at day 25 and day 28 (Figure 1). 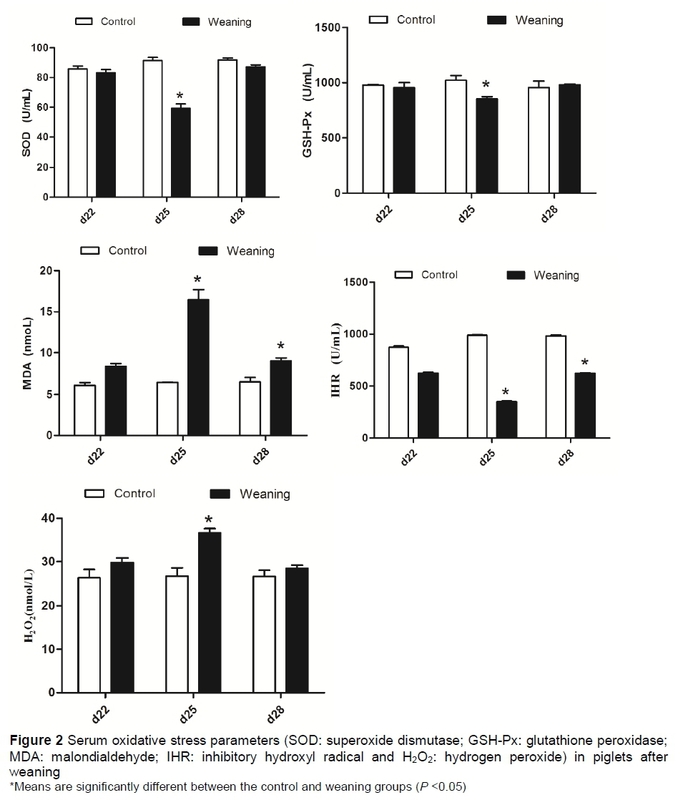 The effects of weaning on the oxidative stress parameters in serum of piglets are shown in Figure 2. Compared with the control group, the concentration of serum H2O2 in the weaning group was significantly increased (P <0.05) at day 25. There were no significant differences (P >0.05) between these two groups at days 22 and 28. The results of antioxidant enzymes showed that the activities of serum SOD showed no difference (P > 0.05) between these two groups. Compared with control group, the activity of serum GSH-Px was significantly decreased (P <0.05) in the weaning group at day 25, but not different (P >0.05) at days 22 and 28. The concentration of IHR was significantly decreased (P <0.05) in the weaning group at days 25 and 28, but not different (P >0.05) at day 22. Results of oxidative injury showed that weaning significantly increased (P <0.05) the serum MDA at days 25 and 28. No significant difference (P >0.05) about concentration of MDA was observed at day 22 between the two groups. 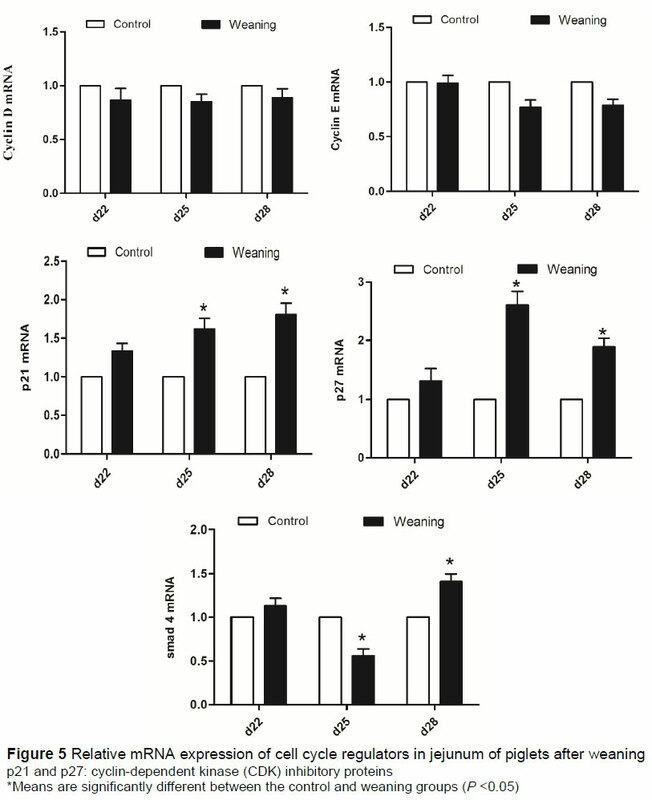 As shown in Figure 3, compared with the control group, the concentration of NO in the jejunum was significantly increased (P <0.05) in the weaning group at s 22 and 28. No significant difference (P >0.05) was observed at day 25. The concentration of H2O2in the jejunum was significantly increased (P <0.05) in the weaning group at days 22, 25 and 28. As shown in Figure 4 and Table 3, compared with the control group, weaning significantly decreased (P <0.05) the villus heights and width, increased (P <0.05) the crypt depths at day 25. No significant differences (P >0.05) of morphology were observed at day 22 and day 28 between the two groups. The mRNA expression of cyclin D, cyclin E, p21, p27 and Smad4 are presented in the jejunum (Figure 5). The mRNA expression levels of cyclin D and cyclin E were not significantly different (P >0.05) between the two groups. Compared with the control group, relative mRNA expressions of p21 and p27 were significantly higher (P <0.05) in the weaning group at day 25, but not different at days 22 and 28 (P >0.05). The relative mRNA expression of Smad4 was significantly decreased in the weaning group at day 25 (P <0.05), but was increased (P <0.05) at day 28. Protein expression levels of cell cycle regulators in the jejunum are shown in Figure 6. Protein expression levels of cyclin D and cyclin E were not significantly different (P >0.05) between these groups. Compared with the control group, p21 and p27 expressions were significantly increased (P <0.05) in the weaning group at day 25 and 28. Furthermore, the protein expression of p27 was significantly increased (P <0.05) at day 22. The expression levels of Smad4 in the weaning group were significantly decreased (P <0.05) at day 25 but increased significantly (P <0.05) at day 28. Early weaning has been reported to induce mucosal shedding and villous atrophy, resulting in barrier dysfunction and disorders in the small intestines of piglets (Pluske et al., 1997). In the present study, results showed that the concentrations of free radicals were increased, and the activities of antioxidant enzymes were decreased in weaning piglets. Oxidative stress parameters demonstrated the intracellular redox state was imbalanced and more seriously so in the weaning piglets at day 25. This is quite critical because excessive ROS production can produce significant damage to cell structure (Zhu et al., 2013). The decreased villus height, width and increased crypt depth were found in the jejunum of weaning piglets in the current study. In agreement with earlier reports, the morphological analyses of the current result indicated that weaning stress could result in villus shortening and crypt hyperplasia in the intestines of pig. Many researchers found that the upregulation expression of cell cycle inhibitory protein such as p21 and p27 could lead to cell cycle arrest which can cause growth retardation (Burch et al., 2005). Thus, the findings of the current study indicated that ROS-induced cell cycle arrest can be a mechanism resulting in the loss of jejunum development in post-weaning piglets. In mammalian cells, intracellular ROS are reported to modulate expression of cell cycle regulators such as cyclin D and cyclin E (Martinez et al., 2002). The transcription of cyclin D1 can be regulated by the transcription factors such as Ap-1 and Sp1 interacting with binding sites in the promoter region in response to oxidants (Menon et al., 2007). In the study by Burch et al. (2004), oxidative stress can also inhibit entry of Fra-1 (it may be the most potent activator in regulating cyclin D1 expression) into the nucleus and block cyclin D1 expression. Hence, the redox state could significantly influence transcription and expression of cyclin D and cyclin E.
The activation of MAPK signalling pathway enhances the growth-inhibitory function of p21 and p27 in response to oxidative stress (Bianco et al., 2011). Chung et al. (2002) observed that H2O2 induced up-regulation of p21, which leads to G2/M phase arrest in H1299 cells. In addition, high ROS levels can lead to adverse cellular events such as inhibition of proliferation and autophagy via the p53/p21 axis, which can induce cell cycle arrest (Gudkov & Komarova, 2003; Gongpan et al., 2016). Zhu et al. (2012) reported that the redox-active transcription factor, p53, was up-regulated in the small intestines of post-weaning piglets. It is indicated that up-regulation of p53 contributed to p21 protein accumulation with G0/G1 phase cell cycle arrest in MCF-7cells (Agrawal et al., 1996). Active development of stem cell in intestines is also controlled precisely by Smad signalling pathways. Smad4 is found to be a key transcript modulator in gastrointestinal epithelial regeneration (Lee & Bae, 2002; Cui & Chang, 2016). Additionally, p21 acts as a downstream effector of Smad4 (Bauer et al., 2016). Datto et al (1995) reported that growth arrest was regulated by the reduction of Smad4, which increased the expression of p21 in intestinal stem cells. Furthermore, Wang et al. (2011) reported that knockdown of Smad4 significantly inhibited proliferation of porcine granulosa cell and resulted in G0/G1 arrest, suggesting the important regulation role of Smad4 in cell growth and development. In the present study, results of qRT-PCR and western blot analysis showed that Smad4 were significantly decreased in the jejunum of weaning piglets at day 25, while p21 and p27 expressions were significantly increased. In addition, the expression of Smad4 in the weaning group increased at day 28 probably suggested that the inhibitory role was gradually relieved, caused by weaning. Our histological evaluation results also suggested that villus height and crypt depth of weaning piglets have recovered to the preweaning values. A study has also reported that the overproduction of ROS can regulate the protein expression of p27, which inhibits S-phase entry and induces the DNA-damage (Fikaris et al., 2006). In some reports, the transcription of p27 also could be mediated by forkhead box O (Foxo) (Agrawal et al., 1996). As the transcription factor, Foxo3a, enters the nucleus and controls the expression of genes involved in cell cycle withdrawal in response to oxidative stress (Sedding, 2008), DNA-damage and cell cycle withdrawal are associated with the loss of intestinal development. These findings are in accordance with the current study. Yin et al. (1999) reported that p21 could inactivate cyclin D/CDK complexes following H2O2 stimulation. Cheng et al. (1999) suggested that tensile forces mediate growth inhibition in the G0/G1 phase through decreasing the expression of cyclin D and cyclin E in murine fibroblasts. Sheaff et al. (1997) demonstrated that increase of oxidants also induced p27 to bind to cyclin E/CDK2 complex, and inhibited cyclin E activity, consequently leading to cell arrest at G1/S phase. In the present study, cyclin D and cyclin E protein abundance and mRNA expression in the intestinal mucosa are slightly lower in weaned piglets than in the control piglets. Similarly, Yin et al. (2016) indicated that cyclin A was reduced in weaning pigs, and they suggested that cell cycle arrest occurred. In the present study, p21 and p27 at the mRNA and protein levels were significantly increased in the weaning group compared with the control group at day 25. In accordance with the present finding, an earlier study in mice showed that Barnouin et al. (2002) observed a transient multi-phase cell cycle arrest through reduction of cyclin D and p21 up-regulated expression induced by H2O2. Here, the intestinal morphological changes induced by weaning decreased villus height, decreased width, and crypt hyperplasia. The results of the present study demonstrated that the intestinal epithelial cell proliferation in weaning piglets was regressed, probably because p21 and p27 inhibited the activities of cyclin E and cyclin D complexes and mediated intestinal epithelial cell cycle arrest. In conclusion, weaning induces overproduction of ROS, which may contribute to cell cycle arrest through the up-regulation of p21 and p27. Smad4 also mediates the up-regulation of p21.The p21 and p27 may inhibit the activities of cyclin D and cyclin E complexes and suppress cell cycle progression at G1, thereby inhibited intestinal epithelial cell proliferation and caused the loss of development in weaning piglets. Further studies are needed to investigate how ROS acts as signalling molecules regulating proliferation and growth arrest in weaning piglets. This study was supported financially by the National Natural Science Foundation of China (Grant No. 31872367).